The Goelet family settled in New York in the 17th century and soon established a family tradition of constant, quiet acquisition of Manhattan property. There was one cardinal rule: land was never sold. The Goelet fortunes increased through leases rather than sales. When eccentric bachelor Peter Goelet died in 1879, the bulk of his estate went to his two nephews, Robert and Ogden. By now New York City was spreading northward and the value of the Goelet vast land holdings – once rural meadows and woods—was multiplying. The fortunes of the already wealthy Robert and Ogden Goelet were nearly doubled upon the death of their father. Unlike some of the self-made industrialist millionaires of 19th Century New York, the brothers were well-educated and well-mannered. There was a refinement about them that set the brothers a bit apart from the nouveau-riche. As they married, each commissioned the architect E. H. Kendall to design a grand mansion on Fifth Avenue, diagonally across from one another. Construction of Ogden’s residence, at No. 608 on the southwest corner of 49th Street, began in 1882. Kendall designed a lavish, four-story structure above a deep basement of rough-cut stone. Absent were the curves and arches fashionable on homes of a decade earlier. Instead sharp angles and geometric lines defined the mansion. It would be set back from the sidewalk, protected by a wide, deep light moat. The top floor would detonate in pyramidal caps, ornate iron cresting, highly-ornamented dormers and elaborate chimneys. While the exterior was meant to impress, the interiors would be staggering. Louis Comfort Tiffany’s interior design firm, Associated Artists, was commissioned to decorate the home and the project required a full year to complete. Then, April 14, 1884 the Ogden and Mary Goelet opened the doors to society. 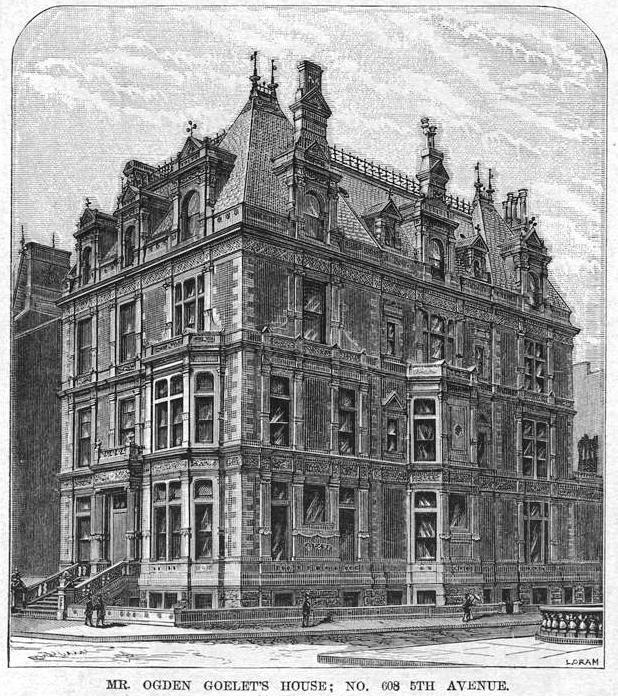 The New York Times society page sub-headline read “Their Splendid New House thrown Open to Their Friends.” “Their friends” required over 500 invitations, most of which were accepted. In the 1880s in Manhattan, grand balls and glittering entertainments were a matter of fact. Men in evening clothes and women dripping in pearls and jewels routinely dined and danced in the opulent rooms of Fifth Avenue. But this night was special. The guests who ascended the wide entrance stairs into the large hall filled with palms and flowering shrubs included the Astors, Belmonts, Vanderbilts, Van Rensselaers, Lorillards and Livingstons. John Jay and his wife were there as were the Rhinelander sisters, Edwards Pierrepont, Mrs. Lloyd Aspinwall and General and Mrs. McClellan. Ward McAllister, cohort of Caroline Astor and self-appointed authoritarian on society protocol, was among the high-toned crowd. No one, it seems, wanted to pass up the opportunity to be seen at the opening event of the Spring social season of 1884. Guests danced in the 14-century style drawing room with its oak paneling. Tiffany brightened the somber wooden walls by hanging the windows with embroidered gold and chenille draperies. A second drawing room was decidedly French with painted insets in the paneling and above the marble mantel with its bronze figures was hung a carved marble medallion of Louis XV. Beyond the dining room was the conservatory to the rear of the home. As was normal for 19th century society, things began late. The guests began filing in around 11 pm. Mary Ogden had Tiffany & Co. create “very pretty favors in silver,” as The Times reported; and after dancing supper (which was catered by Pinard, Mary’s favored chef) was served in the dining rooms on petite Louis XVI tables. Both Ogden and Mary were yachting enthusiasts. Although he donated the Goelet Cups as prizes for the annual New York Yacht Club races, his interest was in cruising rather than racing. And although they did build one of the most lavish mansions in Newport, Ochre Court, the couple preferred to sail abroad on their schooner Norseman. The house on Fifth Avenue saw less and less of Ogden and Mary Goelet. The Goelets purchased Wimborne House, one of the most attractive mansions in London, and were nearly as well-known in Paris and London society circles as they were in New York and Newport; even becoming close friends with the Prince of Wales. 1896 was a socially-stellar year for the Goelets. England was celebrating the Golden Jubilee of Victoria and Wimborne House was the scene of a dinner for the Prince of Wales, reported to be “one of the social successes of the season.” On April 7, while in Nice, the Prince received his mother, Queen Victoria, aboard the royal yacht Britannia and took advantage of the occasion to present the Goelets to her Majesty. At the time, however, Ogden’s health “had not been rugged for several years,” as The Times worded it. The following summer he became ill. The Mayflower was at anchor off the Isle of Wight when he took a turn for the worse. The Prince of Wales’ physician, Sir William Henry Broadbent, was called to the yacht and stayed with Goelet for several days. On August 27, 1897 Ogden Goelet died aboard the Mayflower. Mary received the houses, including No. 608 and its “engravings, prints, books, pamphlets, household furniture, silver plate, china, paintings, tapestry, statuary, bric-a-brac, works of art, jewelry, watches, trinkets, horses, carriages, stable, farm and garden tools, etc.” The estate was valued at around $60 million. Dinner was served by Sherry’s, “whose men wore handsome liveries” and the guest list included the most elite of continental and New York society. Along with foreigners like the Countess Grey, Count Quadt, Captains von Grumme, Schmidt von Schwind and von Mueller, were John Jacob Astor, August Belmont, Stuyvesant Fish and Assistant Secretary of State David J. Hill. The following year the home was the center of activity as Mary prepared for the society wedding of the season. Daughter Mary would marry the Duke of Roxburghe in St. Thomas Church and New York society was atwitter with the arrival of titled Europeans. Because of the small number of guests invited to the church—merely 500—the immense sanctuary was “reduced by the use of huge palms to the size of an English chapel,” reported The Times. The vested choir of 50 men and boys led the procession down the aisle as a cordon of policemen prevented anyone without a card from entering the church. Afterwards, 150 guests were entertained at the Goelet house. The reception rooms were decorated with a veil of orchids and vines and the large mantel in the hall was banked with American Beauty roses and yellow orchids. A trellis work of deep red roses was formed over the sides of the massive staircase to the second floor. On the evening of June 20, 1904, Mary Ogden returned home from “a small function” and removed her jewels, placing them in their case. They were then secured in the safe in her boudoir. Only Mary and her maid had the five keys necessary to access the jewelry. The following month the maid carried the jewel case to the carriage as Mary prepared to go to the Newport mansion. While dressing for dinner at Ochre Court on July 19, she was startled to find the $200,000 worth of jewels missing. Tiffany & Co. circulated fliers with illustrations of the jewelry and the Pinkerton bureau was put on the case. A reward of $10,000 was offered. Within a few days it was announced that Mary Ogden had found the jewels back in her safe in the Fifth Avenue house. The search was called off and not everyone was content to believe that Mary had merely forgotten that she had left the jewel case at home. Many looked askance at the maid who, they believed, had stealthily replaced the stolen jewels in a panic. While most of society moved northward along Central Park after the turn of the century, Mary Ogden remained in the immense mansion at No. 608. In 1911 a widening of Fifth Avenue was cause for the wide and dramatic front stoop to be removed. The work site became something like a scene from a silent movie comedy when, around 5:00 on September 22, a dense swarm of bees descended on a wooden soap box sitting on a sawhorse. Before long the box was covered with buzzing insects and passersby were collecting to see the curious sight. When one workman overturned the box, trapping most of the bees inside, those still free began stinging the crowd. “All hands scattered. No policeman could have done better,” reported The Sun. When one woman complained that the poor bees were suffocating, a workman thrust a stick under a corner of the box to admit air. Immediately the swarm came out, flying into taxi cab windows and scaring delivery horses. Mrs. Ogden’s refined and cultured home was the scene of panic and chaos. When the bees returned to the box, things came to a peaceful end when Policeman Lawler soaked it in kerosene and lit a match. An aging Mary Goelet moved into a suite at the Savoy-Plaza Hotel in 1926. The blinds on the windows of No. 608 were pulled, the doors were locked and the house sat empty on a busy Fifth Avenue now lined with office and retail buildings. Three years later the 73-year old Mary contracted influenza which developed into pneumonia. Within six days she was dead. As she had requested, her funeral was held in the Fifth Avenue house. On February 25, 1929 the rooms of the Ogden mansion were bedecked with flowers for the last time—lilies, roses, gardenias and lilies of the valley. The entire St. Thomas Church choir was grouped in the entrance hall and New York society spilled into three rooms. As Mary’s casket, covered with violets and orchids, was carried out of the house through the massive doors draped with orchid-colored streamers and laurel, policemen held back the gawking crowds. The grand home would not be opened again until November when the furnishings and artwork were auctioned. Rare carpets, Hepplewhite dining chairs, and Louix XV antiques were sold along with Sevres porcelain vases, tapestries and silver. When it was over, the rooms that had glittered with the lavish entertainments of the 1880s and 1890s were empty and silent. 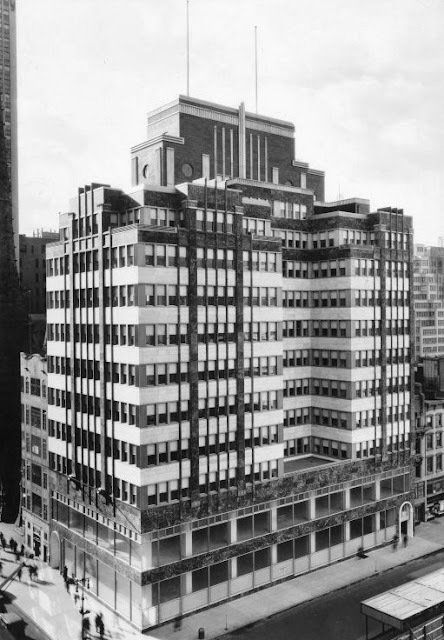 In its place rose the Goelet Building, a remarkable 1930s office building that survives today. Wonderful post and fascinating story. You mention something that has long puzzled me- the late hours at which entertainments in the late 19th-early 20th century took place. Did the men take themselves to their offices for a 9AM start the next day? Like surviving menus of the era with their mind and stomach bending plethora of courses, the late hours raise interesting (to me at least) questions of how, from a practical standpoint, it was all handled. As recently as the 1960s, in my personal experience, the invitation to a "small dance" (not small, certainly upward of 200) given by an individual or couple would specify 10:30, possibly 10 o'clock. The premise is that you would have dinner at 8, especially if it were at one of the large prefatory dinner parties, and after a little more primping, it would be time to go. Upon arrival, one processed through one or two social secretaries, usually in black lace, at a table in an anteroom to be checked off the list of those invited. The throng in line was a social occasion in an of itself, and it might well take half an hour to get to the receiving line. Supper in adjacent rooms was continuous any time after 1 with time and seating at the option of the guests. In perhaps 1960, the parties for Toby Atterbury, Lynn Cox Freed, and Charlotte Dorrance Colket in Philadelphia and for Mina Craven and Irene du Pont at Granogue followed this pattern. In later years the parties were fewer, more were given by groups or charities and the meaning and value faded; the hour for which one was invited might approach 9PM. As for the late hours, the guest list was of people assumed to have considerable flexibility in scheduling their lives. I have an idea that John Jacob Astor or Cornelius Vanderbilt II could pretty much start their days whenever they felt like it! That's always what I've assumed when reading about these late night social obligations. Have always admired Ochre Court and knew some of the stories associated with it. Great to know more about the Goelets' Fifth Avenue Residence as well! Adolph A. Weinman's Colossal "Civic Fame"